Dr Mitchell is a biochemical and molecular geneticist at CHU Ste-Justine. He is also professor at the Montreal University Medical Genetics and Pediatrics Department. His research team works on several hereditary diseases, including Tyrosinemia. Dr Mitchell is also responsible for the development of the research protocol that allowed children affected with Tyrosinemia to have access to NTBC. His reputation in the field of hereditary diseases in pediatric hereditary diseases largely exceeds the Quebec frontiere. Dr Josée Dubois is chief of the Medical Imagery Department at CHU Sainte-Justine where she specializes in diagnostic, pediatric and interventional radiology. She is also chief of the interventional radiology section of the Medical Imagery Department. Dr Dubois is also Vice-Dean for the Montreal University Medical post-doctoral studies. She has also been an important member of several professional associations such as the Royal College of Physicians and Surgeons of Canada. She has published several articles, books and book chapters. Dr Dubois has also been invited as a speaker in several international conferences. Dr Tanguay started his carreer at the CHUL research centre where he got interested in gene proteins induced by a heat shock (HSP). He created a research program on hereditary tyrosinemia and, thanks to his work, the mutation found in Saguenay-Lac-Saint-Jean patients was identified, thus allowing carrier screening in this region. Dr Alvarez is a pediatric hepatologis at CHU Sainte-Justine in Montreal where he acts as director of the liver transplant program. He is also professor at the Université de Montréal pediatric department. His research interests mainly pertain to hepatic diseases in children, immunology and intercultural pediactrics. Professor Grompe is the Director of the Oregon Stem Cell Center and the Papé Family Pediatric Research Institute in the Department of Pediatrics at Oregon Health & Sciences University in Portland, Oregon, USA. His clinical practice focuses on metabolic diseases. His research has focused on the use of in vivo selection to enhance gene and cell therapy. The biology of intra- and extrahepatic liver stem cells and their use in therapeutic liver repopulation are a particular interest. His lab generated the Fah knockout mouse model of hereditary tyrosinemia and recently developed a method to repopulate Fah mutant livers with human hepatocytes. After pursuing medical and pediatric studies in Tours, Dr Ogier specialized in the management of hereditary metabolic diseases. She worked at the Necker Hospiral genetic service in Paris and at the CHU Ste-Justine in Montreal. She is in charge of the Metabolic disease clinic at Robert Debré Hospital. She is also responsible for the implemented and coordination of the Reference centre for inherited metabolic diseases. She also created the French Society for the study of metabolic inherited errors for which she also acts as president. Francjan J. van Spronsen, MD, is a metabolic paediatrician at Beatrix Hospital, University Medical Centre of Groningen (UMCG). He did a PhD study on PKU and Tyrosinemia type I being a MD for metabolic diseases. He supervises two clinical units and had his training for metabolic diseases at the UMCG. Since 2001 he has joined the metabolic team as paediatrician metabolic diseases. In March 2013, he was appointed full professor in paediatrics with special interest in defects in amino acid metabolism and some months later became in charge of the Division of Metabolic Diseases in the children’s hospital of the university medical centre in Groningen. He currently treats patients with metabolic diseases from birth into adulthood. His research focus is on the causes and consequences of defects in amino acid metabolism and the relationships between metabolic control, metabolic pathways and neurocognitive outcomes. At a national level, he chairs the Advisory Committee on Neonatal Screening with respect to inherited metabolic diseases, and is a member of the Dutch Committee on Neonatal Screening. At an international level, he chairs the Scientific Advisory Board of the European Society of PKU and Allied Disorders, and is a member/chair of various European and international advisory boards and working groups for both PKU and Tyrosinaemia type I.
Manon Bouchard is a professional dietitian who has been working at CHU Ste-Justine since 1995. She specializes in the treatment of inherited metabolic diseases. 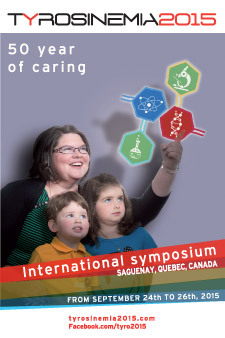 She is a member of several associations, such as the Ordre professionnel des diététistes du Québec, the Genetic Metabolic Dietitians International and the Regroupement des diététistes en maladies métaboliques du Québec. Laurie N. Gottlieb, RN, PhD, is a Professor at the School of Nursing, McGill University where she holds the Flora Madeline Shaw Chair. She is the Nurse-Scholar in Residence at the Jewish General Hospital and is a co-director of the International Institute of Strengths-Based Nursing and Health Care. Her book Strengths-Based Nursing Care was awarded the 2013 American Journal of Nursing Book of the Year Award. Her other books include A Perspective on Health, Family, Learning and Collaborative Partnership, Dreams Have No Expiry Date, (Random House), A Collaborative Partnership Approach to Care (Elsevier). In addition to her books, she has authored numerous articles, editorials, chapters, and monographs. Dr Giguère is a professor at the molecular biology, medical biochemistry and pathology department at the Université Laval Medical School. He is a doctor in biochemistry and is head of the Quebec Neonatal Blood Screening Program. He is a researcher at the Quebec CHU and received funds from the Quebec Health Research Fund (2001-2013). He is president of a Royal College of Physicians and Surgeons of Canada committee specializing in the medical biochemistry and sits on many expert and consultation committees in the filed on perinatalogy and neonatal screening. He is also Head of the molecular diagnosis laboratory of the biochemistry service at Quebec CHU, a leading laboratory of the l’International Federation of Clinical Chemistry and Laboratory Medicine. He qualified in 1983 and trained in medicine and paediatrics in Belfast. He has been a consultant paediatric hepatologist in the Liver Unit at Birmingham Children’s Hospital since 1994. His work involves medical care to children with all forms of liver disease and for those undergoing liver transplantation. He has a particular clinical interest in inherited metabolic liver disease and portal hypertension. His research interests are in the clinical aspects of inherited metabolic liver disease, portal hypertension, novel endoscopic techniques, non-invasive markers of hepatic fibrosis and immunosuppression following liver transplantation. Outside work his interests are his family and grandchildren and he tries to keep fit by cycling. Suzanne Atkinson is from Quebec City. She has completed her Bachelors in Pharmacy and her Masters in Pharmaceutical pratice at Université de Montréal. Then in 2003, she started her carreer as a pharmacist at CHU Sainte-Justine. At first she worked in general pediatrics and infectious diseases but her interest in management led her to become chief assistant in 2011. She also became responsible for the extern department, which includes the follow up of patients affected with Tyrosinemia type 1 and medication distribution to these patients. Marc Bilodeau est hépatologue au CHUM depuis 1995. Il a fait ses études de médecine à l’Université Laval d’où il a obtenu son diplôme en 1987. Il a fait sa formation en médecine interne à l’Université McGill et celle en gastroentérologie à l’Université de Montréal. Il a obtenu une bourse du Conseil de recherches médicales du Canada pour effectuer un stage à l’unité de biologie cellulaire INSERM U-49 à Rennes en France de 1992 à 1995. Il est à la tête d’un laboratoire de recherche de biologie cellulaire du foie au Centre de recherche du CHUM. Il est professeur titulaire au Département de médecine de l’Université de Montréal depuis juin 2014. Il est titulaire de la chaire de recherche en hépatologie Novartis-Fondation canadienne du foie de l’Université de Montréal. Il est aussi chef du service d’hépatologie du CHUM. Ses champs d’intérêt couvrent le carcinome hépatocellulaire, l’infection par le virus de l’hépatite C et la transplantation hépatique. Après avoir terminé mes études de médecine en 2007 à l’Université Libre de Bruxelles, Belgique, et obtenu un diplôme interuniversitaire en gastroentérologie, hépatologie et nutrition pédiatriques à l’Université Pierre & Marie Curie à Paris, France, j’ai effectué un fellowship en gastroentérologie, hépatologie et nutrition pédiatriques au CHU Sainte-Justine, Université de Montréal, QC, Canada entre 2008 et 2010. Mes centres d’intérêts particuliers se concentrant sur les maladies du foie chez l’enfant, j’ai effectué en 2012 une formation post-doctorale complémentaire en immuno-hépatologie dans le laboratoire de Jody L. Baron à l’Université de Californie, San Francisco (UCSF), États-Unis. J’y ai étudié la régulation immunitaire des infections virales hépatotropes (en particulier le virus de l’hépatite B). Je me suis intéressé plus particulièrement aux différences des mécanismes immunitaires menant à l’élimination des agents hépatotropes des foies d’enfants vs de patients adultes, ainsi qu’au facteurs externes pouvant influencer ces réponses immunes. Outre ces centres d’intérêts, je prends en charge un nombre très élevés de patients ayant d’autres maladies chroniques du système gastro-intestinal (maladies inflammatoires de l’intestin, maladie cœliaque, polypose familiale, etc). Enfin, depuis mon engagement en 2010, en collaboration avec l’équipe de génétique du Dr G. Mitchell au CHU Sainte-Justine, j’assure également la prise en charge hépatologique des patients ayant une tyrosinémie.